You get into bodybuilding, grow in size and sometimes they come: stretch marks. Here is what bodybuilders need to know about where stretch marks come from, how to prevent them, what to do when they are there and if any of the various creams and ointments help with stretch mark removal. 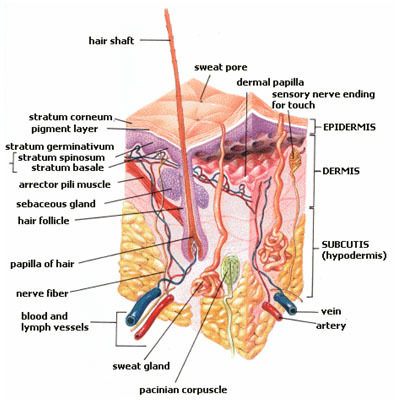 Human skin consists of several layers. The topmost and one you see is the “epidermis”, beneath which resides the “dermis”, that basically keeps your skin in shape through a flexible wire mesh called “connective tissue”. Below the dermis then is the “hypodermis”, where larger blood vessels connect to the smaller ones in the dermis that take away waste products. Finally, below the hypodermis is the fat layer and muscles. The important aspect here is the elasticity of the connective tissue’s wire mesh. While being flexible, it needs time to adjust to changes in size of the underlying fat layer and muscles. If these changes happen too fast, the connective tissue can’t adjust, tears and in the process some of the local blood vessels can be damaged as well. If that happens, “micro-bleedings” take place and the leaked blood seeps into the higher layer and becomes visible as the reddish streaks that stand for a fresh stretch mark. This can be the case when a teenager experiences a growth spurt, when a bodybuilder gains a lot of muscle fast or when a woman is pregnant. No, they aren’t dangerous. Unsightly, yes, but other than that they do not hinder the body’s functioning in any way or form. Over time the body will repair the damage in the blood vessels and what will be left is a white line, much like a scar, where the connective tissue was broken. What To Do About Stretch Marks? This directly leads us over to how to get rid of them. Because the older a stretch mark is, the harder it is to make go away. While tons of ointments and creams promise to take care of stretch marks, these usually only have an effect while a stretch mark is still fresh and has that reddish color. A stretch mark that is already white can very likely only be made to fully disappear through plastic surgery, and then only when the affected piece of skin can be cut out, as the damage runs so deep. Laser therapies in some cases can make the stretch mark less apparent, but mostly won’t make them go away entirely. It therefore is key to do something about your stretch marks as soon as they appear. This isn’t even particularly complicated: All you have to do is aid your skin’s repairing process by using a moisturizer and carefully massaging the area. It’s even better to do this preemptively: Various research has shown that people who take care of their skin before a stretch mark ever appears are much less likely to suffer from them. This is especially important for those of you who have family members that already suffered from stretch marks in one form or the other – you might have inherited the weakness. Pictures courtesy of National Cancer Institute and “Jean & Nathalie“.